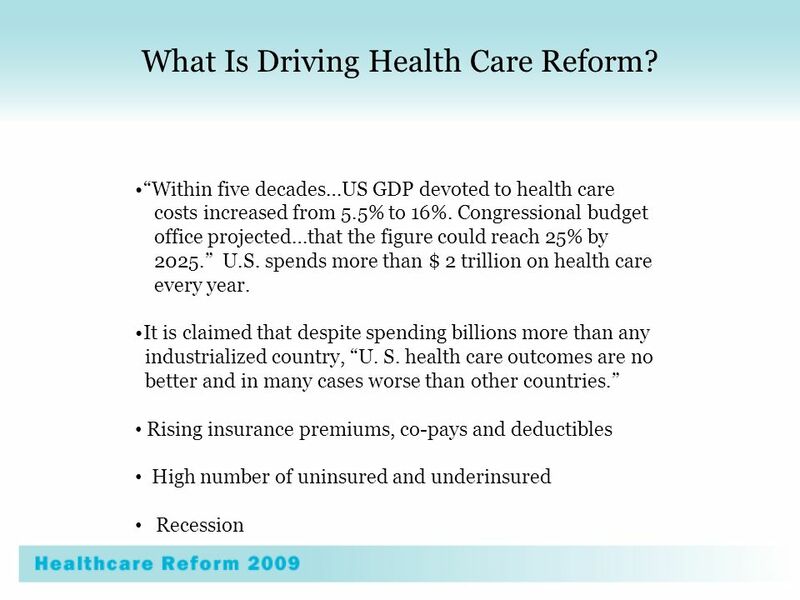 What Is Driving Health Care Reform? Within five decades…US GDP devoted to health care costs increased from 5.5% to 16%. Congressional budget office projected…that. 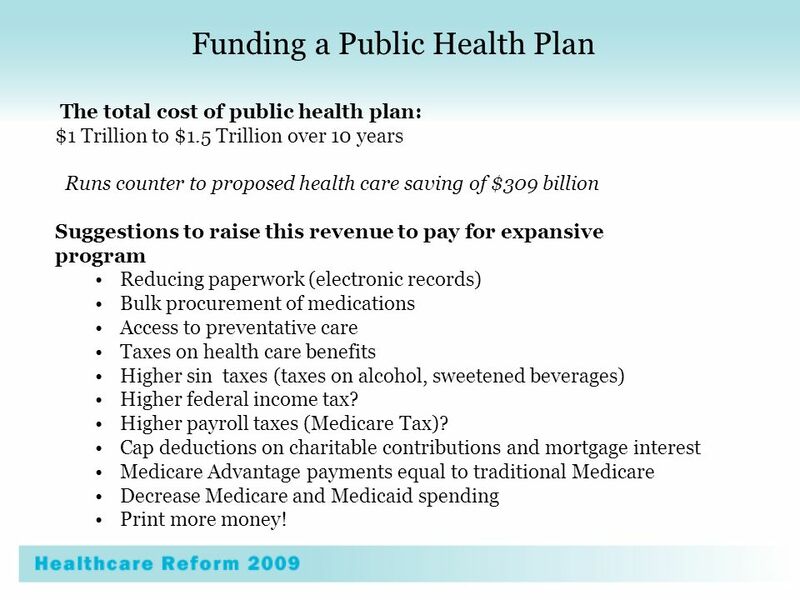 17 Funding a Public Health Plan The total cost of public health plan: $1 Trillion to $1.5 Trillion over 10 years Runs counter to proposed health care saving of $309 billion Suggestions to raise this revenue to pay for expansive program Reducing paperwork (electronic records) Bulk procurement of medications Access to preventative care Taxes on health care benefits Higher sin taxes (taxes on alcohol, sweetened beverages) Higher federal income tax? 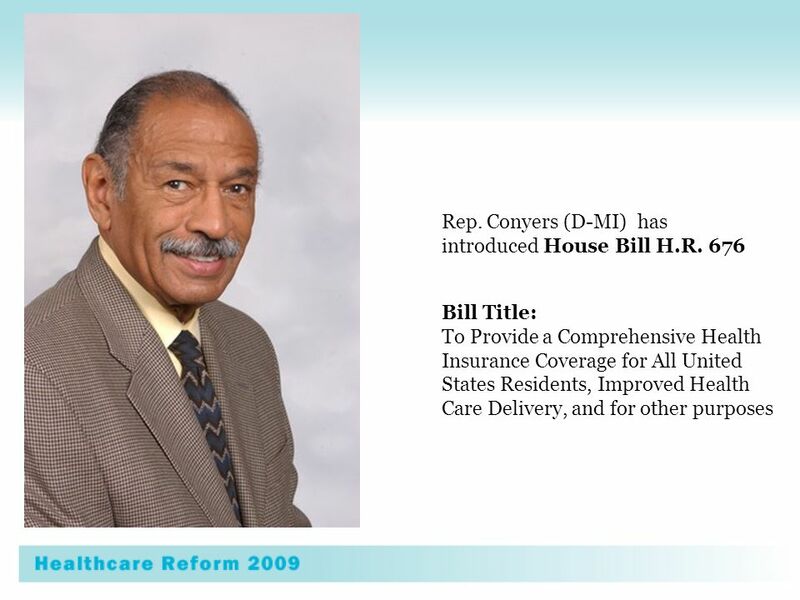 Higher payroll taxes (Medicare Tax)? Cap deductions on charitable contributions and mortgage interest Medicare Advantage payments equal to traditional Medicare Decrease Medicare and Medicaid spending Print more money! 18 H.R. 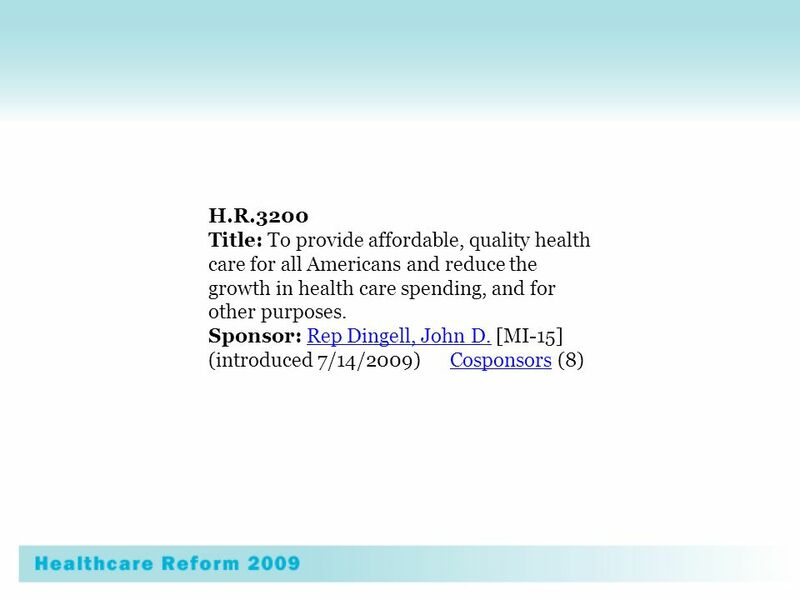 3200 Americas Affordable Health Choices Choices Act of 2009 by Rep. Dingell D Michigan House Ways and Means Committee CBO Douglas W. Elmendorf, Director, July 17, 2009 Collectively, those provisions would yield a significant increase in the number of Americans with health insurance. By 2019, CBO and the staff of JCT estimate, the number of nonelderly people without health insurance would be reduced by about 37 million, leaving about 17 million nonelderly residents uninsured (nearly half of whom would be unauthorized immigrants). 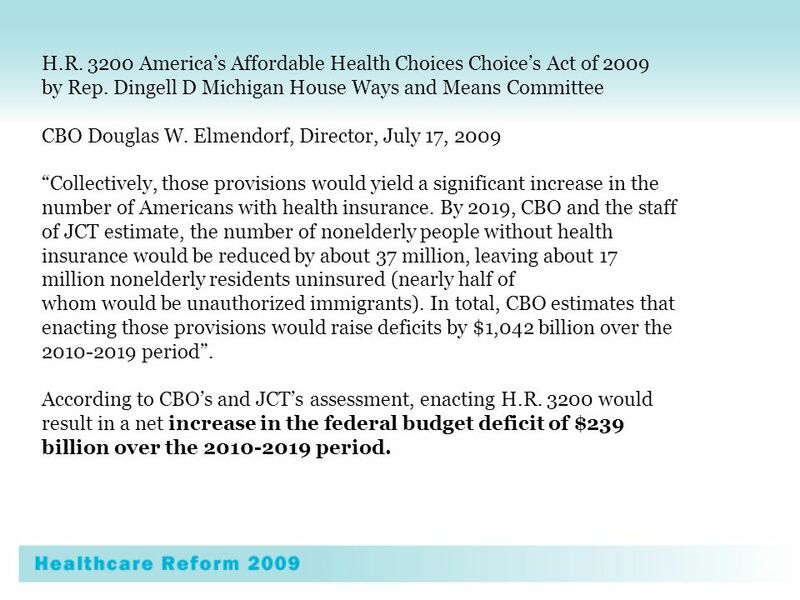 In total, CBO estimates that enacting those provisions would raise deficits by $1,042 billion over the 2010-2019 period. According to CBOs and JCTs assessment, enacting H.R. 3200 would result in a net increase in the federal budget deficit of $239 billion over the 2010-2019 period. 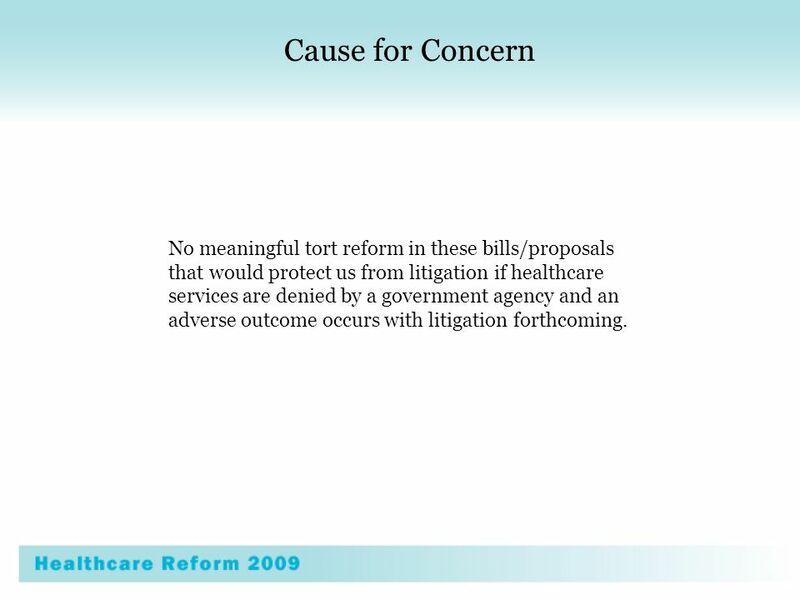 22 Cause for Concern No meaningful tort reform in these bills/proposals that would protect us from litigation if healthcare services are denied by a government agency and an adverse outcome occurs with litigation forthcoming. 24 What You Can Do 1. 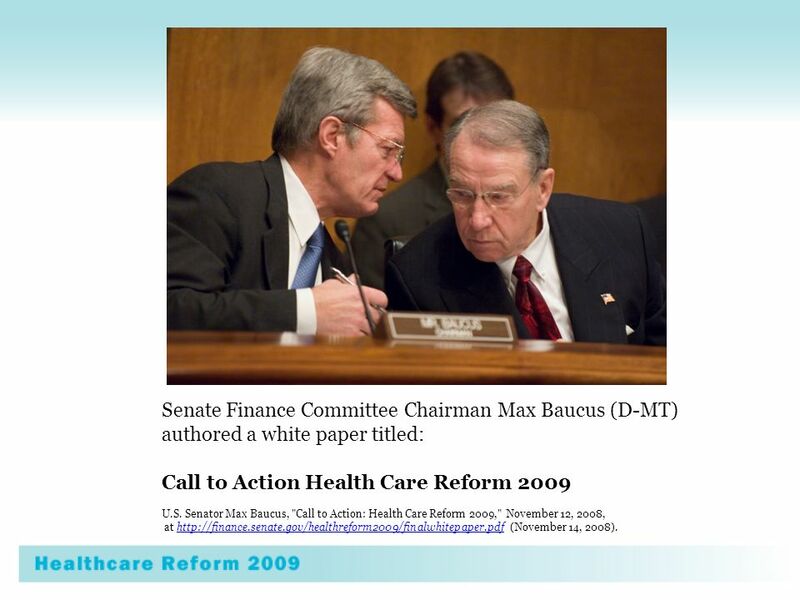 Keep informed about health care legislation (congress.gov), Congressional Quarterly, The Hill, Heritage Foundation. 2. 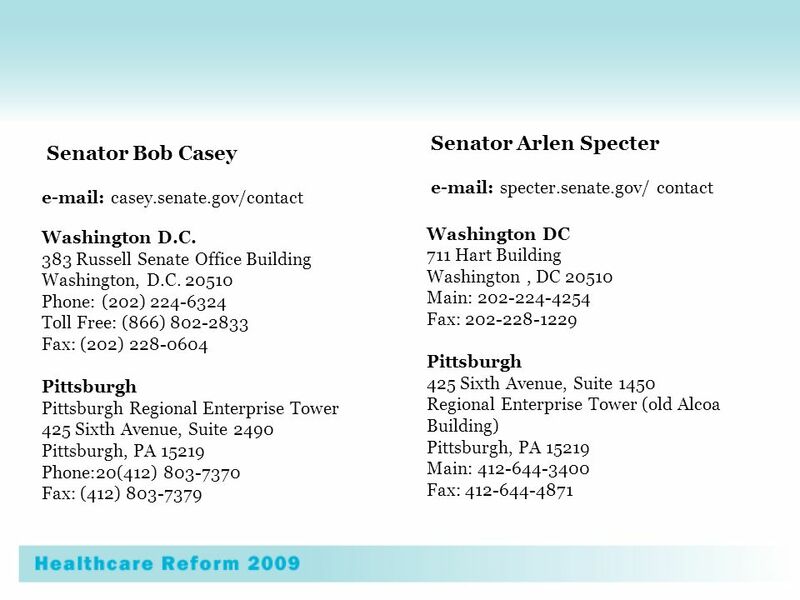 Call your local Senators and Representatives. 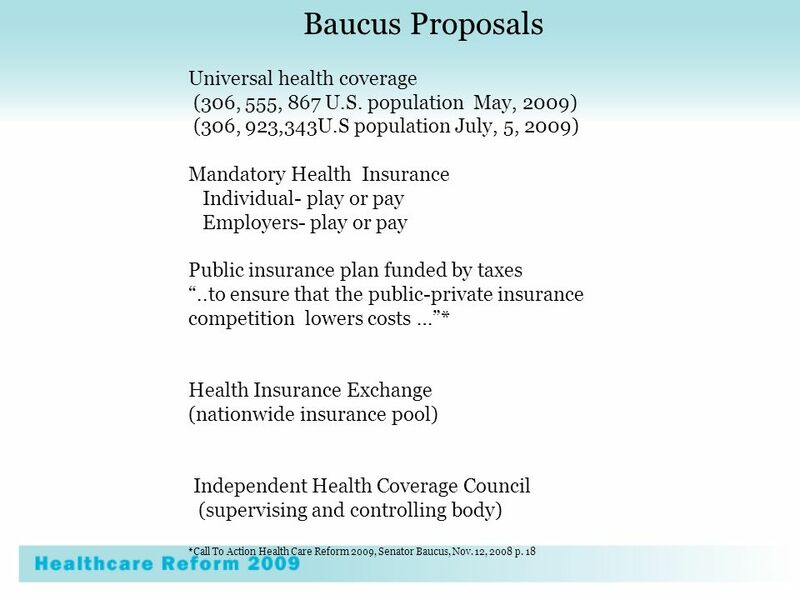 Talking points-if you favor a public health insurance plan: Will you promise not to raise my income tax to support it? 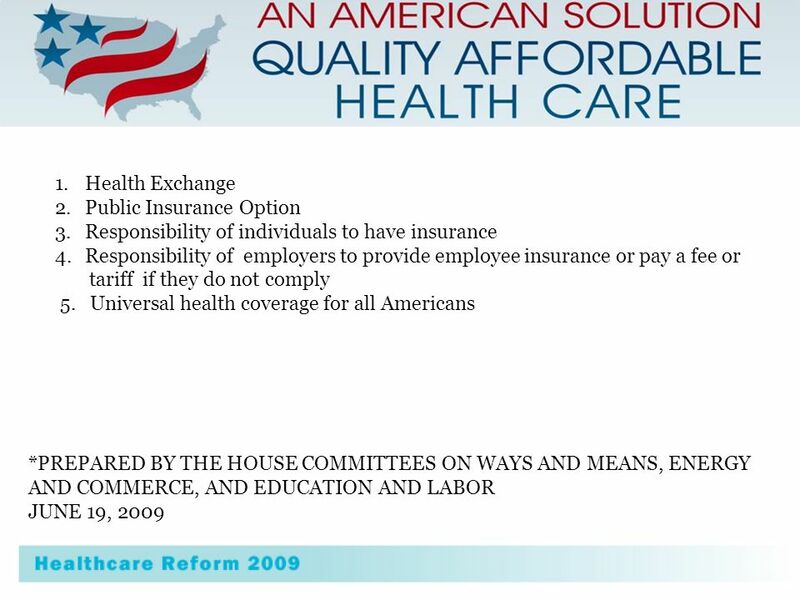 Can you guarantee that it will lower health care costs? Will you be rationing my health care? How will you prevent waste in this public plan? 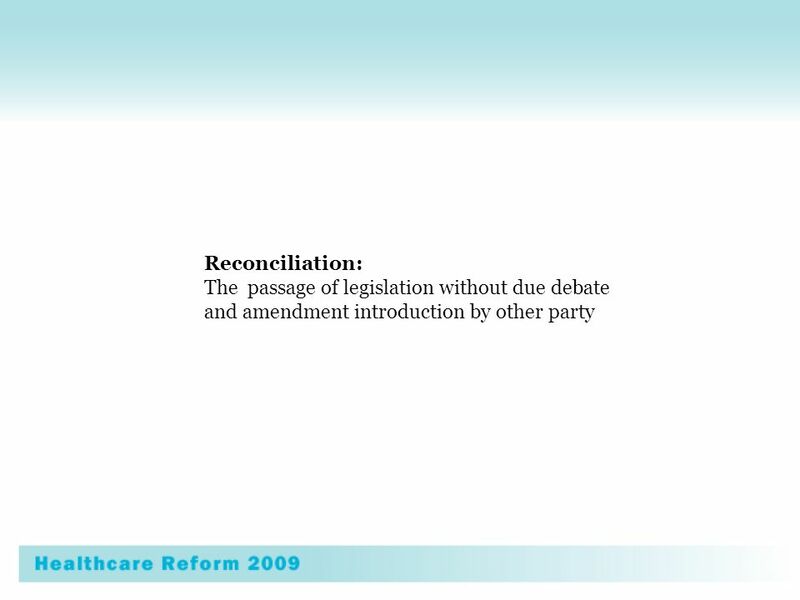 Will you use reconciliation to pass this public plan and not allow debate regarding my health care? 3. Tell your patients, families, and friends about the possible impending changes in their health care that may occur. Provide them with information and encourage them to call their representatives with their concerns. 4. 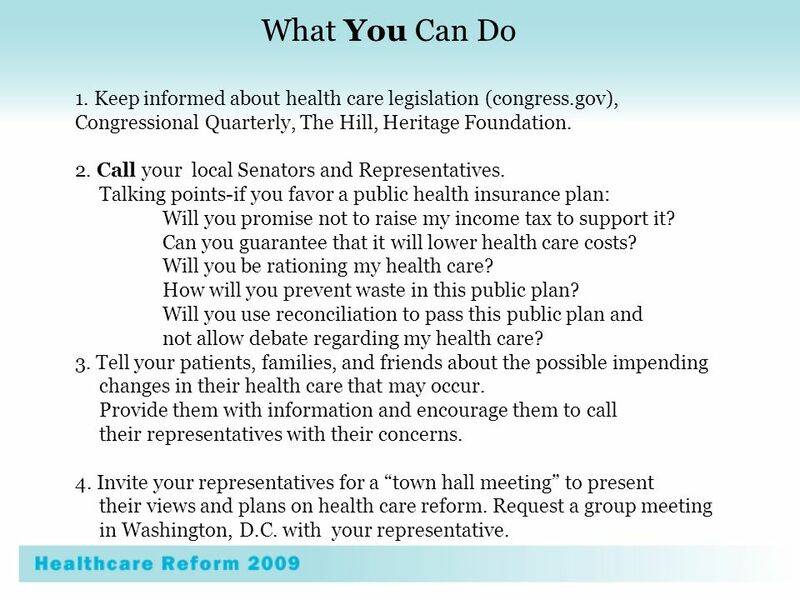 Invite your representatives for a town hall meeting to present their views and plans on health care reform. Request a group meeting in Washington, D.C. with your representative. 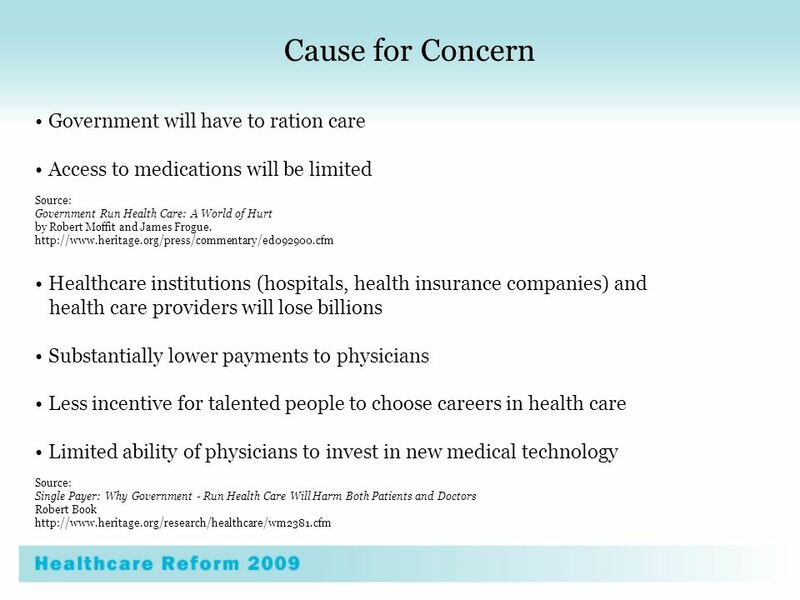 Download ppt "What Is Driving Health Care Reform? Within five decades…US GDP devoted to health care costs increased from 5.5% to 16%. 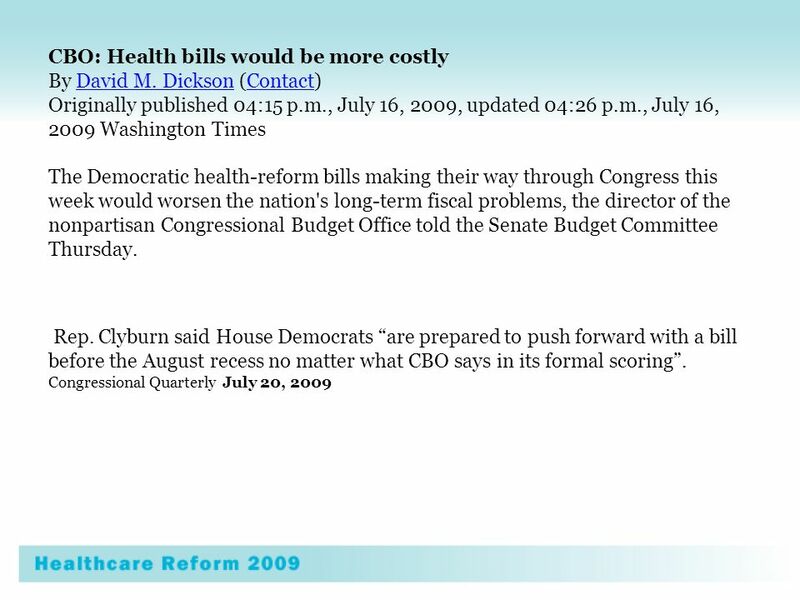 Congressional budget office projected…that." 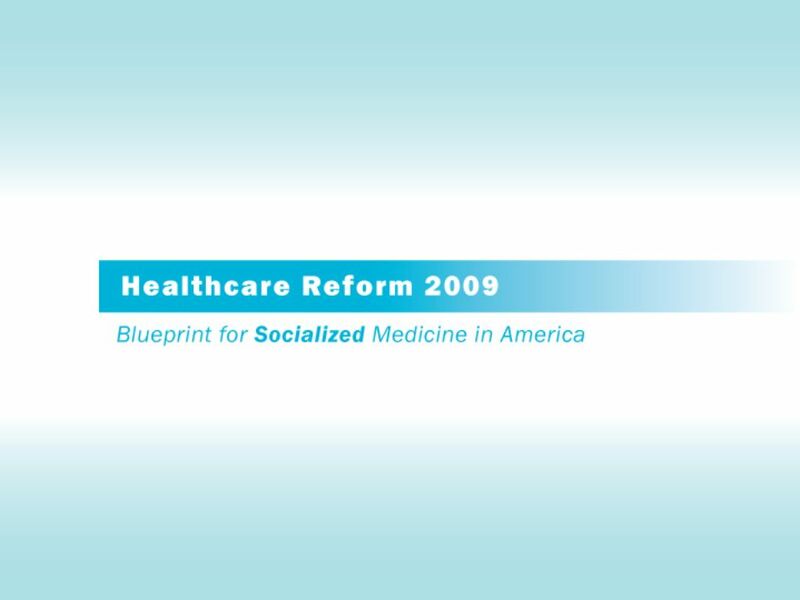 State Efforts to Derail Health Reform Progressive States Network Enzo Pastore Health Policy Specialist x205. 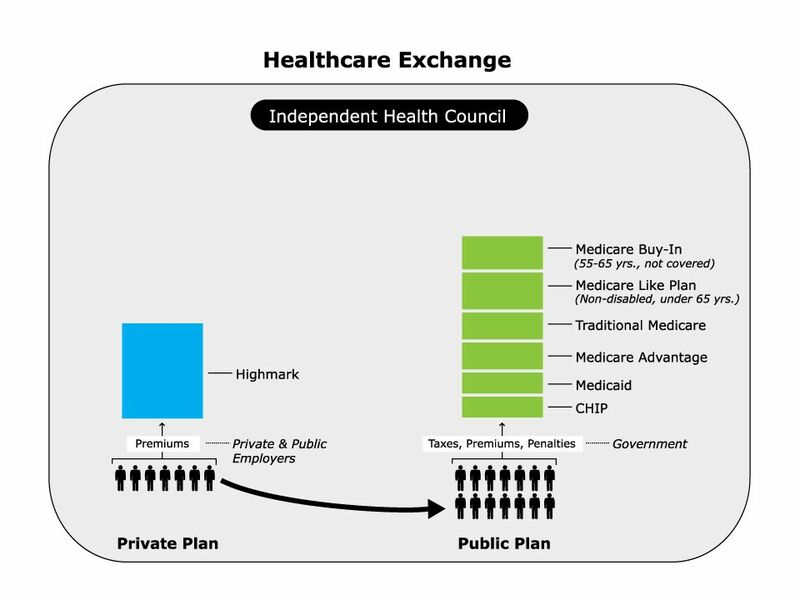 THE COMMONWEALTH FUND Whats in the New Health Reform Law? Karen Davis President, The Commonwealth Fund Alliance for Health Reform Briefing. 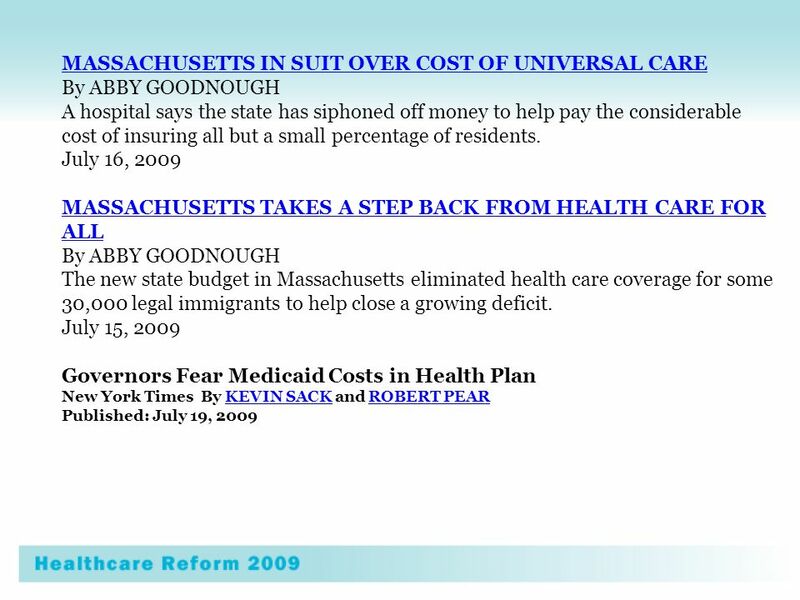 THE COMMONWEALTH FUND 1 We Can’t Continue on Our Current Path: Growth in the Uninsured Data: K. Davis, Changing Course: Trends in Health Insurance Coverage. 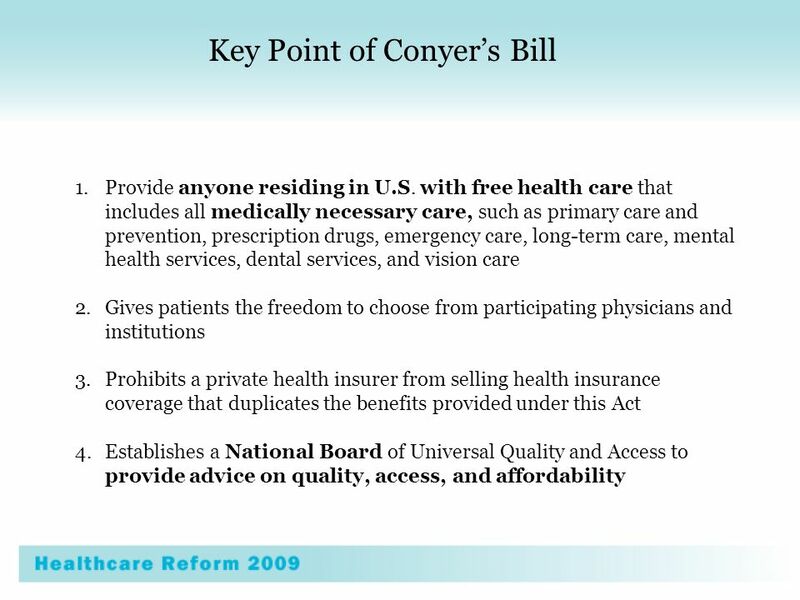 Single Payer 101 Training Universal Health Care for Massachusetts. 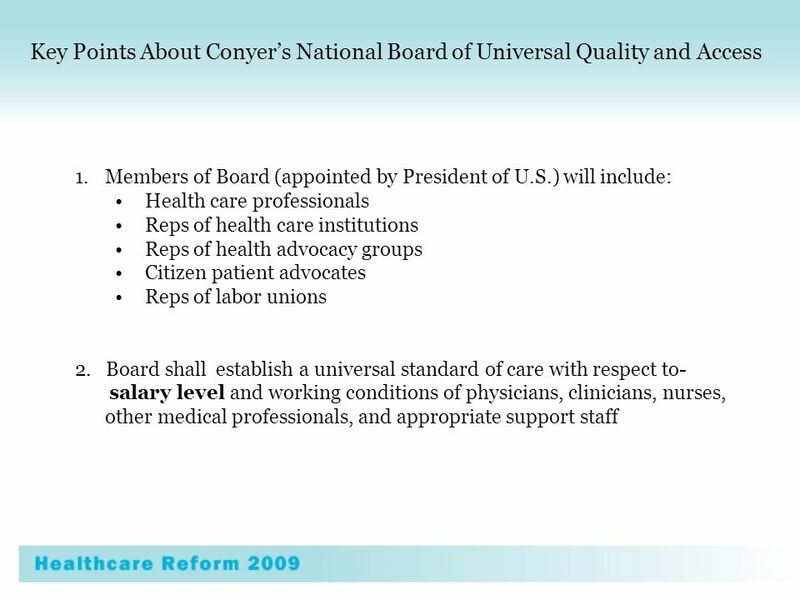 WHY THE UNITED STATES NEEDS A NATIONAL HEALTH PROGRAM A NATIONAL HEALTH PROGRAM Presented by Mary E. O’Brien, M.D. Columbia University Health Service Physicians. 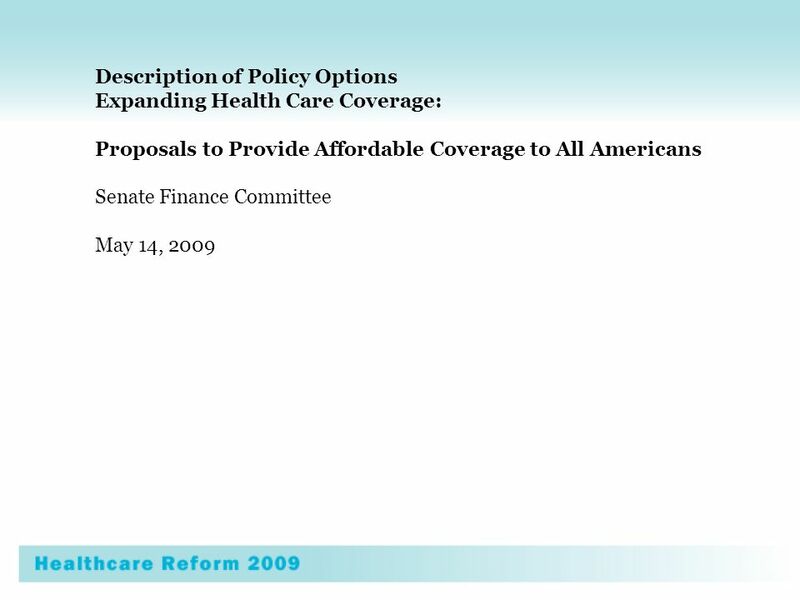 Health Care in Obama’s 1st Year: More of the Same is not Reform – It’s a Placebo Leonard Rodberg, PhD Urban Studies Dept., Queens College/CUNY and NY Metro. Camila Knowles Friday, May 3, 2013 Washington Update Georgia Academy of Healthcare Attorneys. 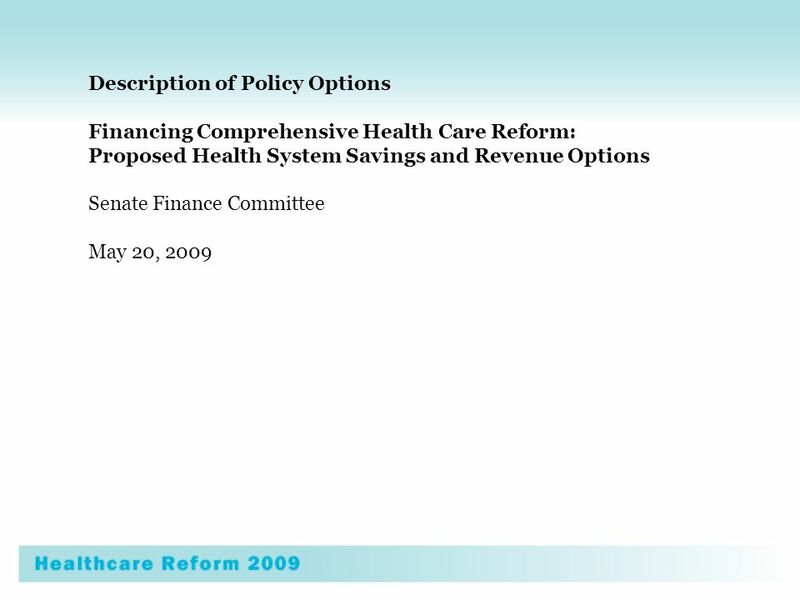 Prepared for the Committee for Health Care for Massachusetts December 14, 2005 ACTION COSTS LESS The Health Care Amendment Standards and Options for Reform. 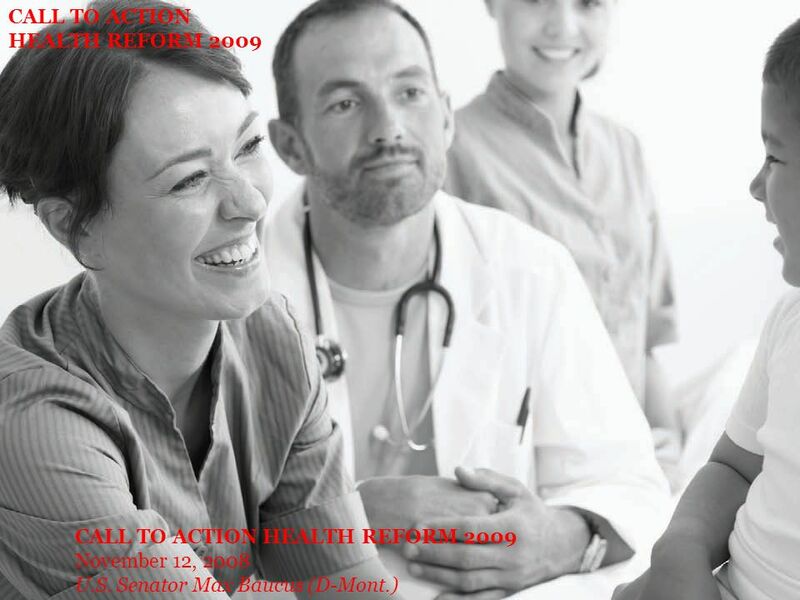 HOUSE BILL – HR 3200 Key Provisions Health Advisory Commission – administration appointees authorized to make ALL the HC rules with primary objective to. 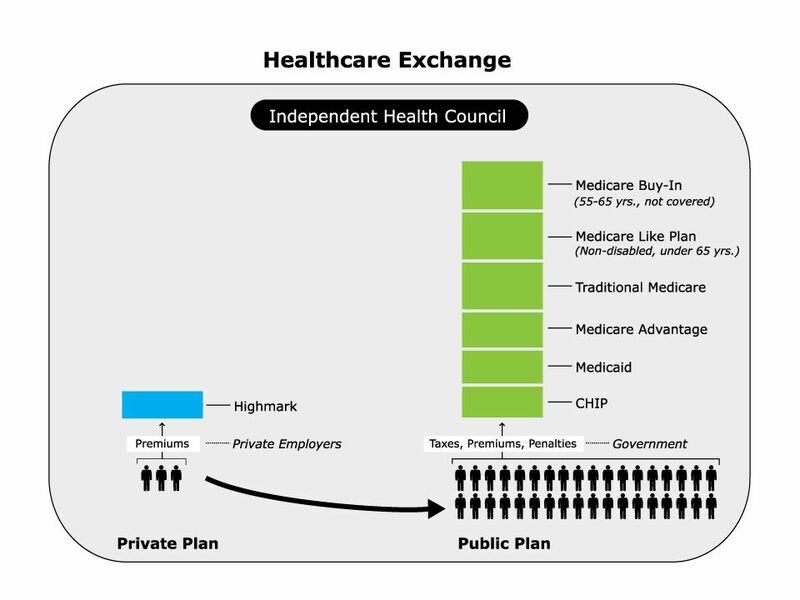 SINGLE PAYER The Next Step for Health Reform (Beyond the Affordable Care Act of 2010) Prepared by Randy Block Co-Chair, Gray Panthers of Metro Detroit. 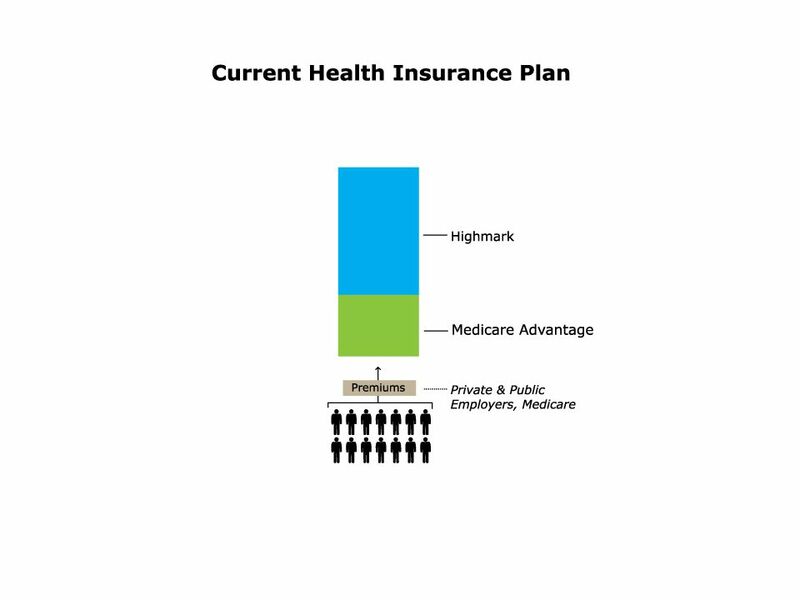 PNHP’s Response to the Obama Health Plan Dr. Ida Hellander, Executive Director Physicians for a National Health Program. 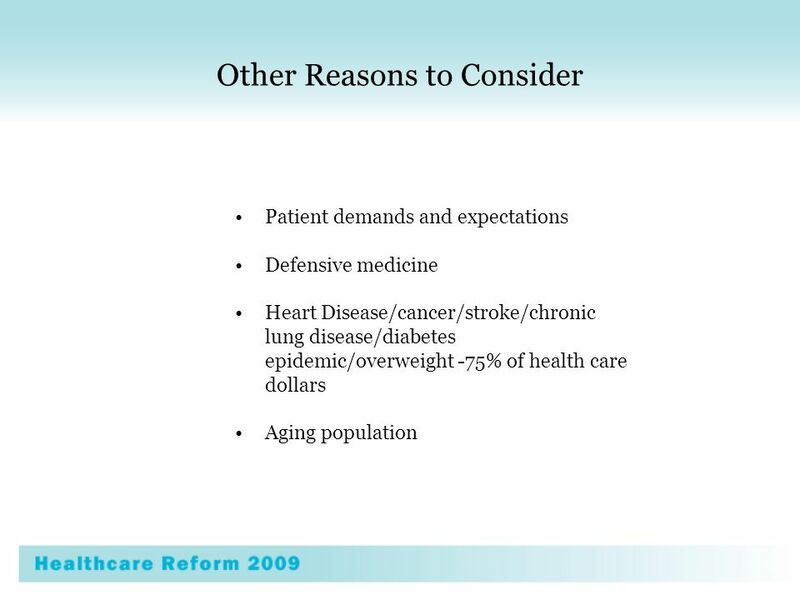 MEDICARE: PAST, PRESENT AND FUTURE James G. Anderson, Ph.D. Department of Sociology & Anthropology.